The ceiling is too often overlooked when you’re trying to improve the look of a room. You’ve probably never considered the visual impact that can be achieved by painting the ceiling in a more vibrant shade or adding some interesting patterns. This neglected space can become a focal point in the room and there’s clearly an important design benefit. 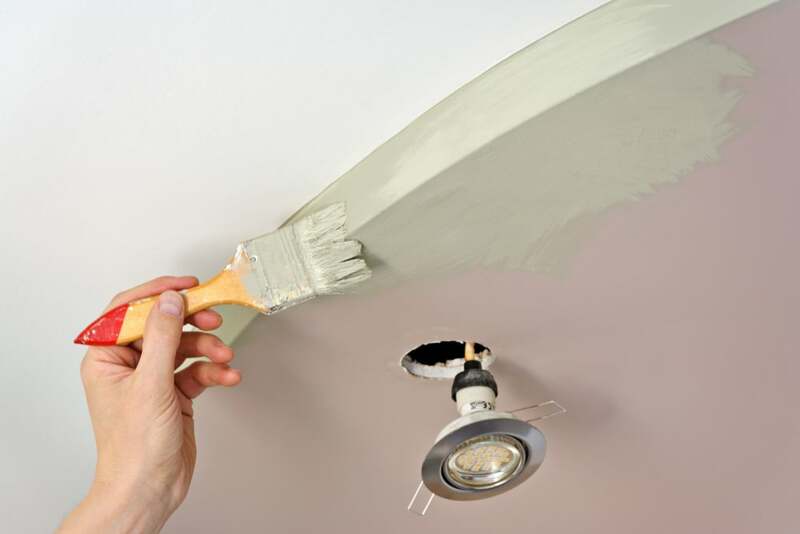 If you wish to avoid making a mistake when painting the ceiling and ending up with a strange look, it’s highly recommended to learn how to approach this design choice. Transforming the white ceiling can have too strong of an effect if you’re not careful to keep a harmonious look through other decorations and elements in the room. There are lots of innovative ideas you can rely upon if you need some inspiration to paint the so-called ‘fifth wall’ in the room. Choosing the best color is key so we’ll first take a look at some of the best shades you can use to update the ceiling to a more stylish design. For a great makeover without attracting too much attention, it’s recommended to go for darker colors. Ceilings painted black, gray, or navy, give off a more intimate feeling. Those with high ceilings can benefit from an extra effect as it makes the ceiling seem lower. Rooms with plenty of natural sunlight can also take advantage of darker shades because of an enhanced contrast. The walls should remain in a pale color if you want to make the ceiling stand out a bit more. The same thing can be said about the furnishings. When it comes to light fixtures, the best solution is to select a contrasting model that matches well the look of the rest of the room. 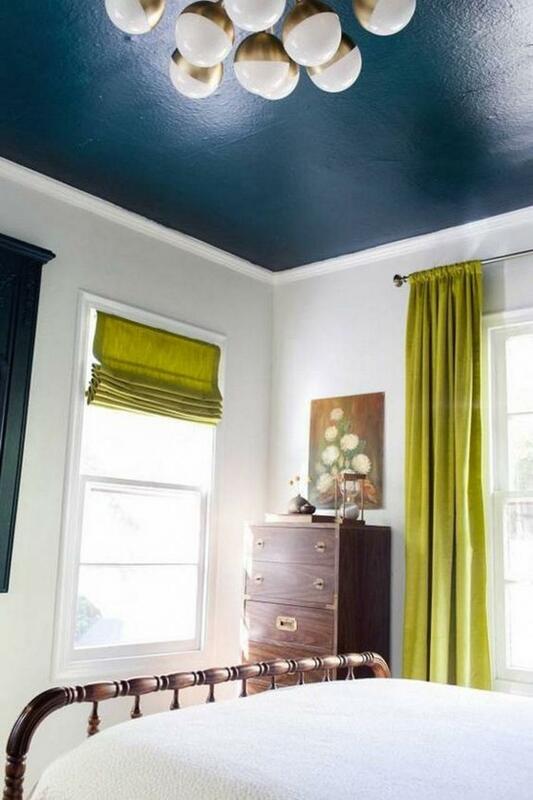 We’ve mentioned black, gray, and navy as these are the most popular dark shades for painting your ceiling. Let’s see the advantages of each color. Black has the power to deliver stylish elegance into any room, and the ceiling is no exception. After you give it a fresh paint, any area can become more intimate. 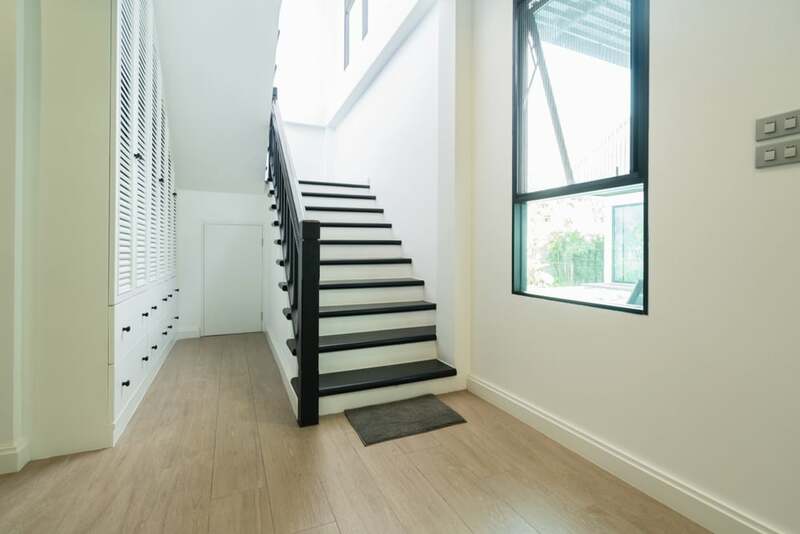 There’s also the added feature of being able to cover some unwanted elements such as unsightly beams. With some decorative crown molding, the ceiling can showcase an even more dramatic look. It’s particularly recommended for an open concept space as it allows the room to feel cozier and warmer. For a chic look, try to select a lighter shade of black and if you would like to boost the elegance to a whole new level, consider painting the walls black to match the ceiling. 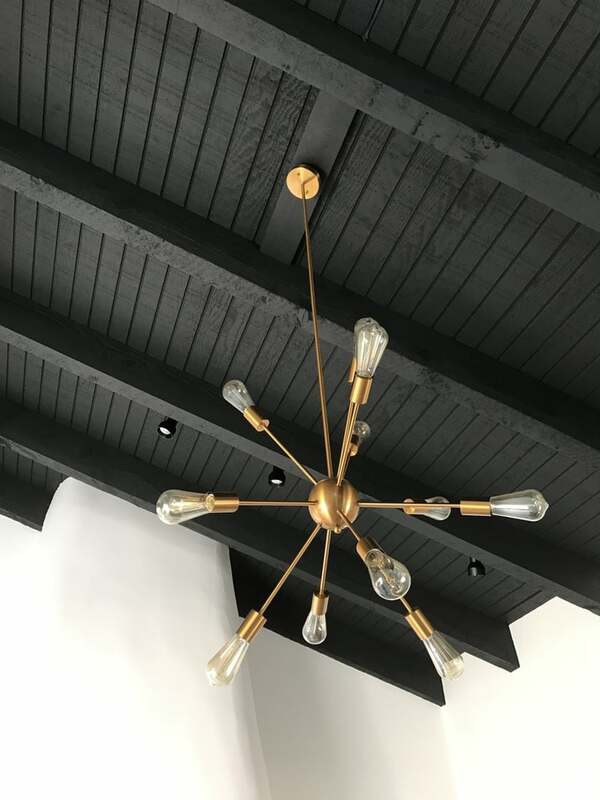 Black ceilings also look stunning when paired with gold finishes. Tones of light gray can make the ceiling livelier when paired with white walls or furnishings. It’s important to make a distinction here as dark gray can create a different impression, one of richness and sophistication. Grey ceiling paint works great for dining rooms or the bedroom. If you go for a lighter shade, the impact of the ceiling on the rest of the room will be fairly subtle. Navy blue is a good choice when you wish to add an unexpected effect in a room. The living space can feel more regal when you combine this color with white or gray accents. The ceiling in the bedroom can especially benefit from this dark shade as it has the power to make an interior feel cozier. It’s also the best solution to finish off a room’s nautical theme as the ceiling seems better integrated when painted with a navy color compared to stark white. Whether it’s yellow, turquoise, or hot pink, painting the ceiling in a bright color represents a very bold statement. Going for a vibrant shade is the right solution if you wish to energize a room and add a captivating point of interest. The vivid impression can be further accentuated with the help of neutral-toned furniture and white walls. The ideal places where bright colors can feel at home are those happy spaces in your house. Pick a fun room that you want to make more exciting. This doesn’t mean that a more functional room, such as the bathroom or kitchen, won’t be able to benefit from the potential of bright colors. Just make sure you keep the rest of the furnishings predominantly white or monochromatic. Yellow represents an obvious choice when it comes to experimenting with a more vibrant color for the ceiling. It packs quite a refreshing visual punch offering some much-needed warmth and energy to an otherwise bland-looking room. 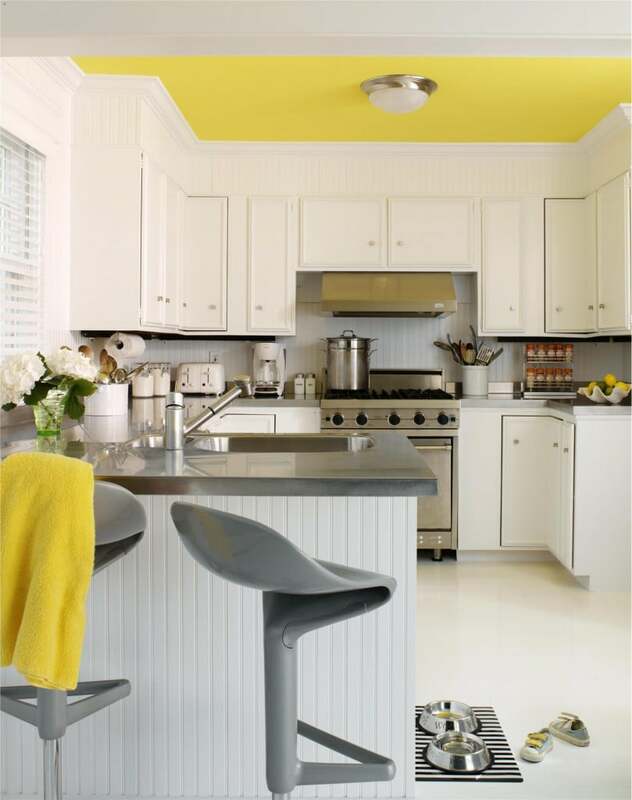 If you like the idea of making your living space happier, consider painting the ceiling in a bright yellow shade. There’s not just a brilliant eye-catching quality to this color, it can also integrate well with other colorful elements in the room. A lemon yellow ceiling can work surprisingly well for a white kitchen as it adds a cheerful vibe in this functional room. It can match colorful walls in the kids playroom to maintain an upbeat sentiment. One magical combination is incorporating a yellow ceiling with purple walls. These two shades can complement each other very nicely. Lighter blue shades can offer a very vibrant look for a wide range of room styles. Consider a stunning turquoise as it would be an excellent choice for the bedroom or the bathroom. It has the ability to revitalize a plain space. Once again, this kind of bright color should be toned down with the help of neutrals from other elements in the room. 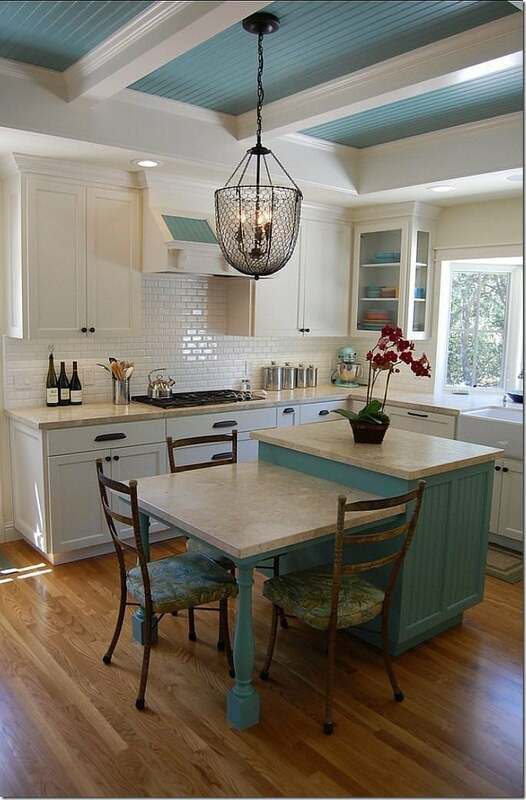 Sky-blue hues can be very fitting for brightening up a kitchen. If you’re worried about a visual impact that’s too strong, another gorgeous idea is to paint the walls in a vibrant turquoise while the ceiling has a matching color but much subtler hue – a very light blue. 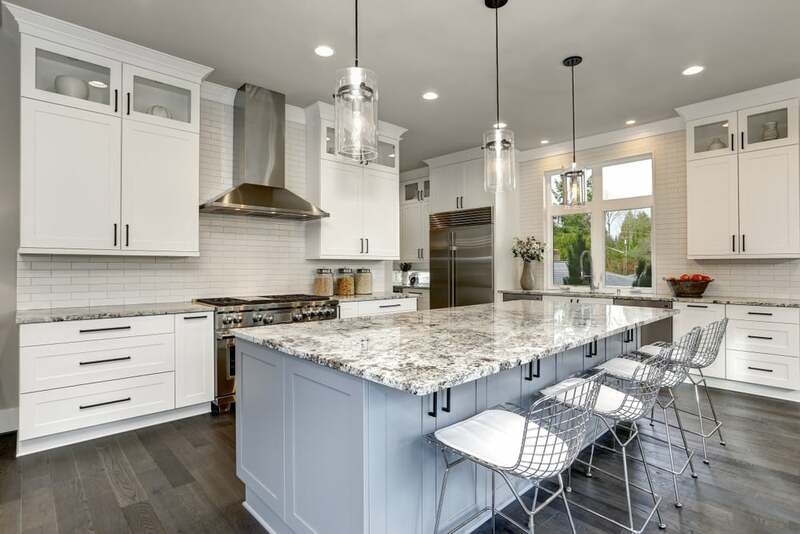 The resulting effect is that your space will feel more open and there will be less attention drawn to old architectural elements on the ceiling. 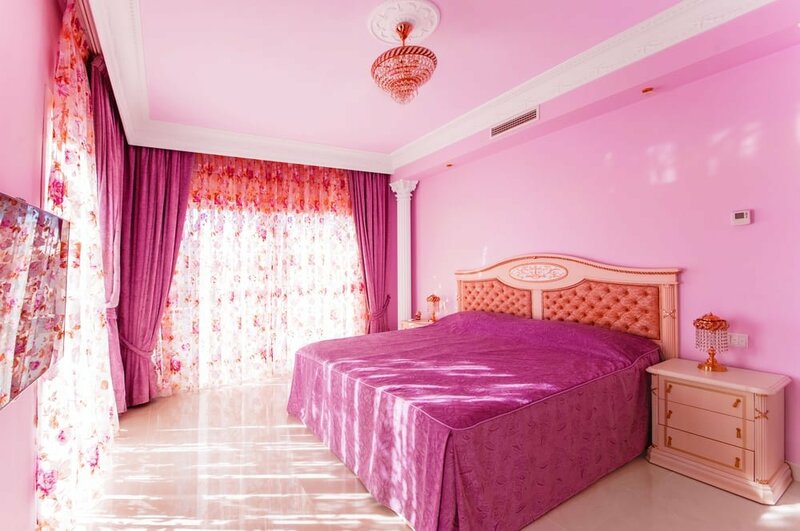 Your bedroom can look more stunning than ever if you paint the ceiling in a bold pink shade. 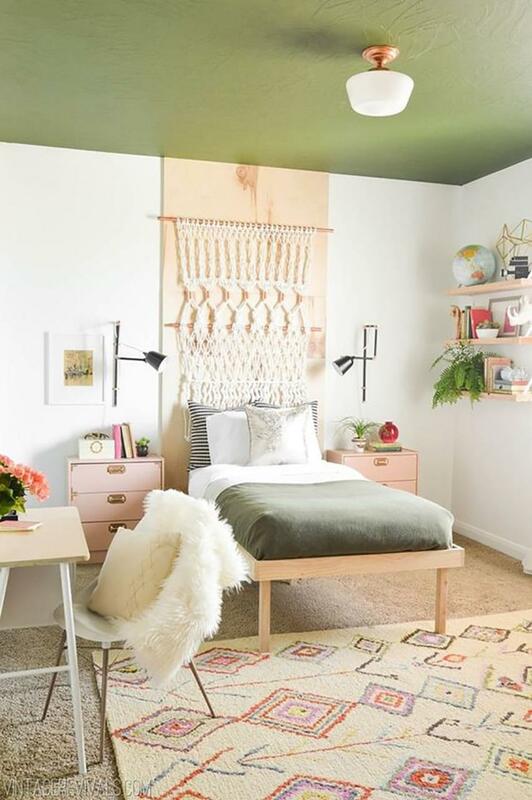 A girl’s bedroom can definitely make use of a lovely touch of this color, but other places can also take advantage of the potential of bright pink to create a colorful statement. Just make sure the rest of the room is balanced with the help of white walls and mostly neutral-toned furniture. Transforming a room in a glamorous style can be done through various elements. 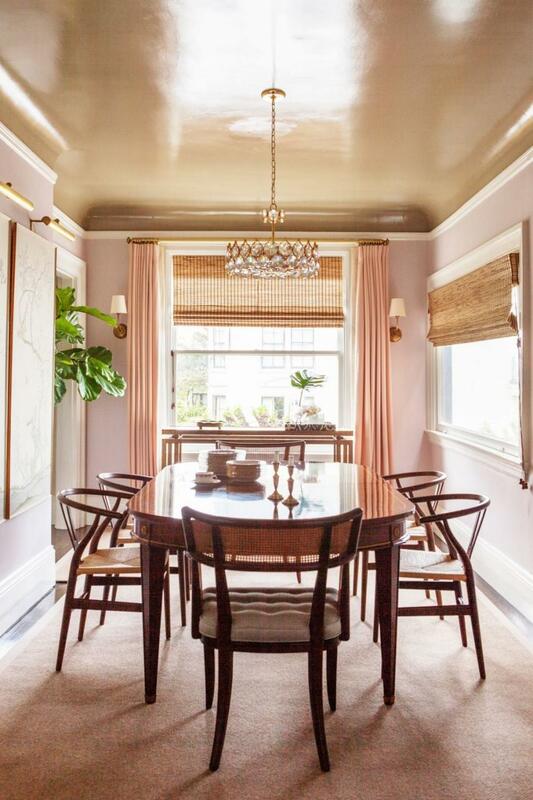 The ceiling can be painted in a shimmery metallic color such as muted silver or gold. It may appear like an overwhelming effect at first, but keep in mind that you will also benefit from some extra depth due to the reflectiveness of the metallic paint. For an enhanced jewel-like look, consider swapping your light fixtures with some brass models like this stylish chandelier from Amazon. They can create a more luxurious feeling when paired with a gold-painted ceiling. As long as you’re careful to not go over the top with the room’s golden accessories, the resulting look should be incredibly glamorous. 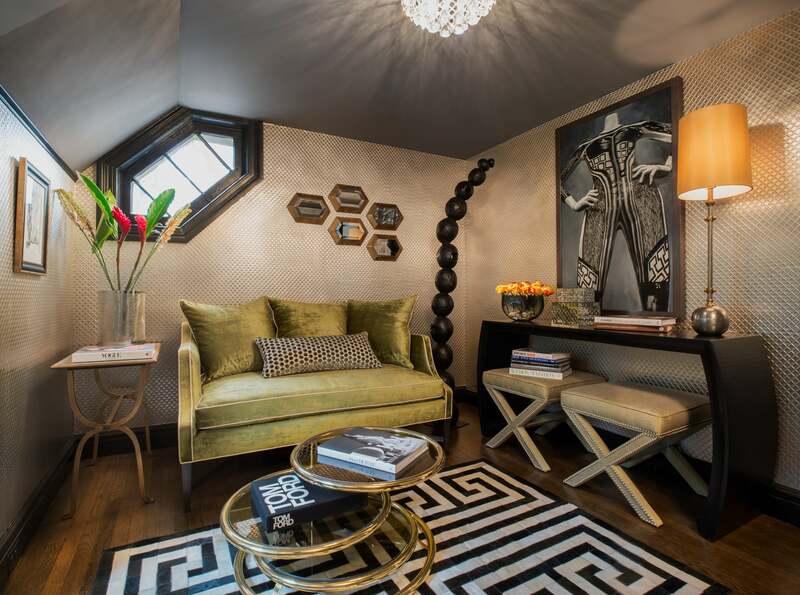 Those who feel more adventurous shouldn’t overlook the huge potential of patterns to create a more striking look. Adding patterns on the ceiling may not be suitable for everyone, but if you desire an extra stylish statement, stripes and geometric shapes can help you. To get a patterned look right, it’s important to keep the color scheme balanced. That means you should mostly focus on adding monochromatic elements. You wouldn’t want the patterned ceiling to accidentally match the geometric style of the rug or sofa upholstery and create a chaotic design that’s unpleasant to the eye. Pretty patterns add a remarkable effect to a room, but they’re also more difficult to incorporate compared to simply painting the ceiling a solid color. Obtaining a patterned ceiling is usually done by either placing a wallpaper or stenciling the pattern on. For the last method, you can do the work yourself if you have artistic talent or just hire a professional. Floral patterns are recommended if you want to add a fresh vibe to the dining room. It can make you feel as if you’re having a picnic in the garden. 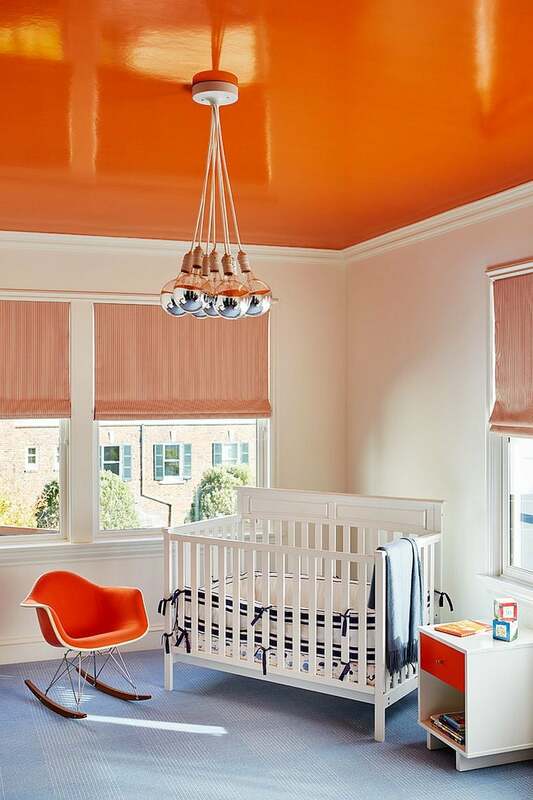 More whimsical patterns and styles can be used to decorate the ceiling in the kids’ room. The colorful environment there should be a good match for a patterned ceiling. Abstract ceiling patterns are more difficult to pull off, but you can also paint the walls in a more eye-catching shade to unite some colors together. The hallway can benefit from some ceiling patterns if you like the idea of a more vibrant entryway. It’s a neat solution for this area as you can make a better impression when receiving guests. 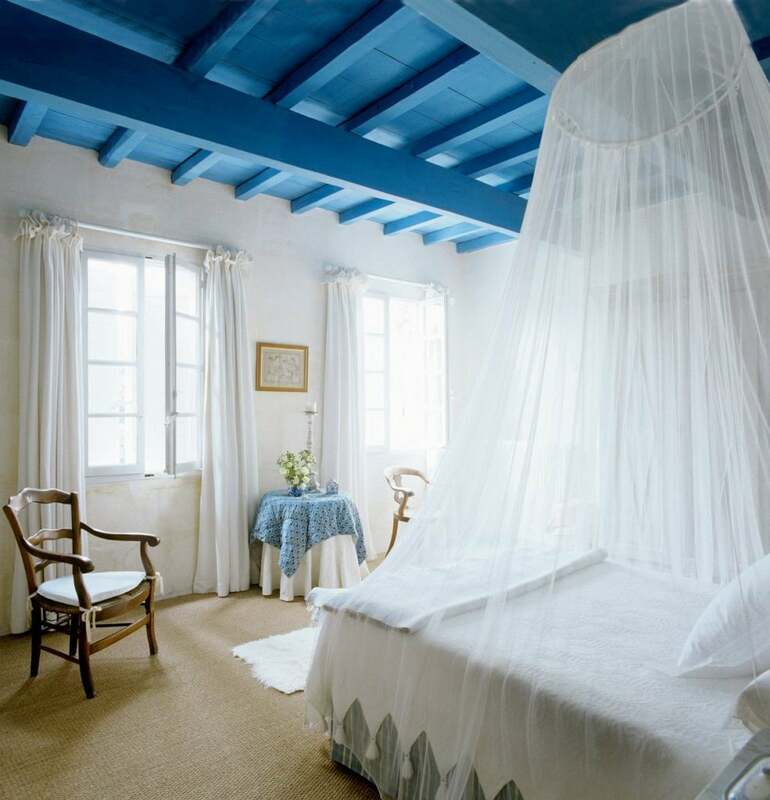 The color of the walls in the room is definitely an important aspect to consider when painting the ceiling. It will certainly influence the final look of the room. Sometimes it’s a good idea to paint the ceiling in the same shade as your walls. This is recommended if you want to make a room appear smaller and cozier as the atmosphere seems to surround you completely with color. The resulting look can be quite sophisticated, especially if you can integrate a white trim to separate the walls from the ceiling. Achieving a contrasting effect is usually a better solution when it comes to pairing the wall color with a painted ceiling. For example, if you’re going with a nautical theme, it would look very balanced to complement a deep navy ceiling with white walls. Keeping the walls white could be a simple solution if you just want the ceiling to stand out. 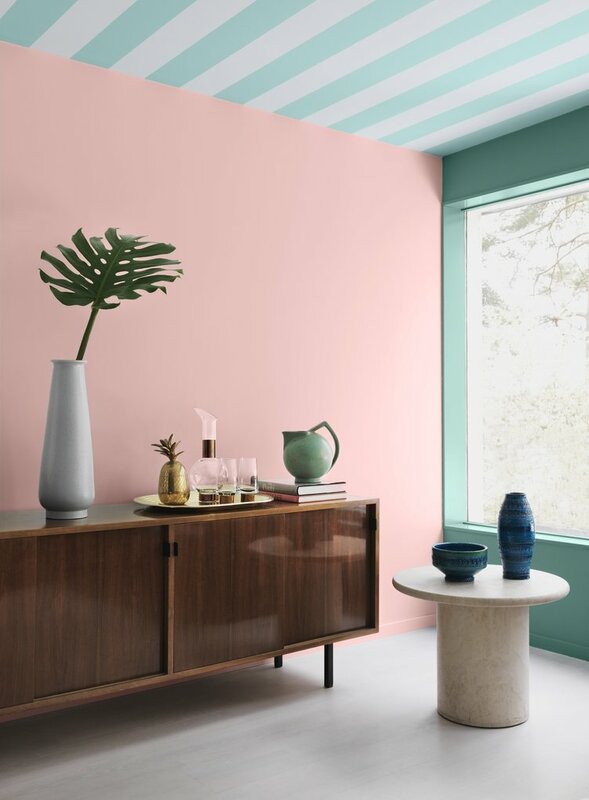 Even so, there are no clear rules here as you can simply decide to paint the walls in a different shade and leave the ceiling white and adding only a subtle glossy effect by polishing it. Minimalists or others who prefer a more subdued color scheme can still crave a splash of color from time to time. If you feel like your bedroom needs a more exciting element to contrast it against the neutral palette, consider adding a rich shade for the ceiling. Painting the ‘fifth wall’ in a stunning green or dark red represents a great solution in this case, especially as it adds an unexpected feeling that captivates the attention immediately. Architectural details such as crown molding or skylights can be easily enhanced with the help of some vibrant paint. It’s natural for moldings and other elements to attract the attention to the ceiling, so why not showcase them even further by bringing some vibrant color into the mix? Covering the ceiling in a uniform color has the capacity to create a stunning effect when used with the right accessories. Clean white walls are also recommended in this case. If you have ceiling beams, it could look more attractive to dress them up with paint that matches the walls. The ceiling can remain white as the matte paint in the rest of the room creates an imposing visual depth. It’s also safe to say that painted ceiling beams offer a superb initial impression. We’ve mentioned how you can create a more intimate space and the illusion of a low ceiling, but paint can also benefit small rooms for the opposite effect. 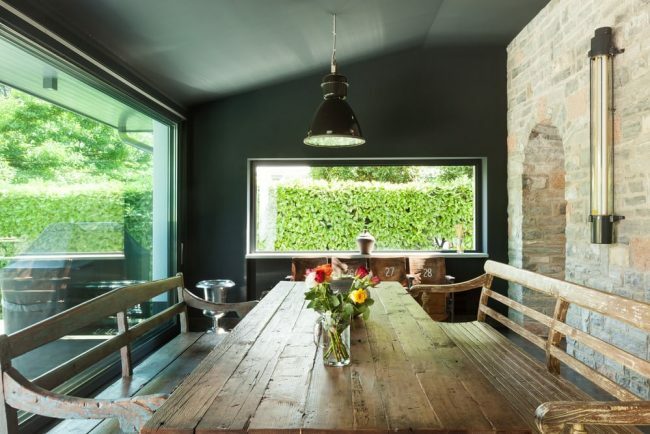 When you combine a dark ceiling paint with lighter walls you should be able to take advantage of a high ceiling effect. Dark gray should be a good match for a small living room and you can opt for a wallpaper in a neutral color like beige to obtain the illusion of a bigger room. Whether it’s a retro kitchen or dining room, this style could use some ceiling color to add to that vintage décor vibe. The retro style is usually bold and exciting, so the ceiling should match that impression through a stylish coat of paint that expands the interest.